Can we afford a Parks and Recreation Master Plan? Council needs to have a long discussion on how much money the city has before they authorize any money for a Parks and Recreation Master Plan. There is good evidence that spending money on this plan will cause us to lose the ability to pay for more important priorities such as maintaining the park facilities we already own and bring our fire fighter/EMS manning levels closer to an efficient and effective standard. One of the problems I have with the current discussion is the lazy way council and staff talk and document the impact a $43K to $90K expenditure would have on our ability to pay our bills. The first place to start is to ask the questions, "how much money do we have, how much do we expect to receive, and how much do we expect to spend" If those all tell us we have extra money then the question becomes one of priorities. Council at Large candidate Rick Stan recently proposed a quick and clean report that could be referenced by the rest of council. This seemed pretty basic the first time I looked at it. In fact, it is so simple I considered it simplistic. However, council is again poised to spend a significant amount of money and we have yet to provide or discuss a public document that gives insight into the figure that goes into the first block of the simplest financial document you could ever imagine. How much cash do you have in the bank? Rick’s “start simplistic” approach has potential and I hope he gets a chance to try it out next year. At this point I was considering inserting a report that we use to get that answers the “how much money do we have in the bank” question in a more sophisticated manner. But then I would digress into trying to answer the question, “why don’t we get it anymore” especially since I have conveyed how important it is over and over again. On page 40 the estimated Income tax revenue was supposed to be $3,149,636.33. We actually received $2,832,327.33. So we have collected $317,309 dollars less so far this year than we expected. Continuing to the next Table in the City Manager Report. We see that Year to Date (YTD) we have collected 3.84% less this year than last year. If I recall correctly our budget did not reduce spending by 3.84%. Going to page 51 the second table shows Operating Expenditures and Encumbrances. A comparison between what we spent at this time last year $9,182,644.34 against what we spent last this year $7,874767.65 looks pretty positive with us spending $1,307,876.69 less dollars so far this year than last. I do not recall what kind of big ticket items we purchased and when last year. Did we pay to replenish salt or purchase a few new trucks last year before the end of February, but did not this year? 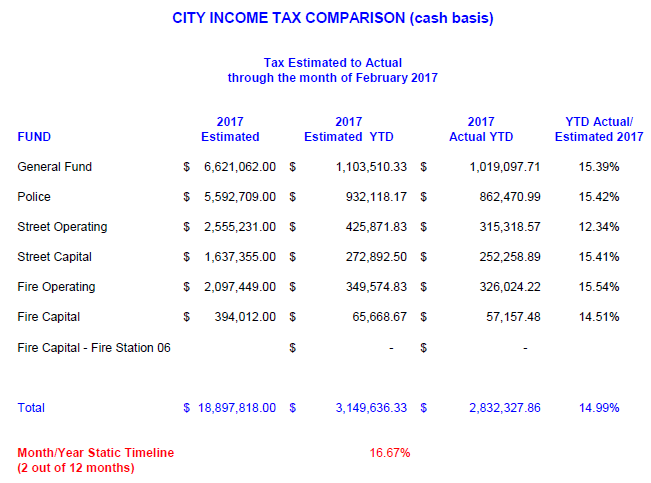 The number council needs to find is the amount of actual expenditures to date 2017 compared to the estimated expenditures to date of 2017. When I first looked at the last table on page 51 I initially thought that a table named “Operating Budget” would provide that information. I looked at the $6,105,188.48 2017 YTD figure and thought this might be the estimated budgeted amount. Comparing this to $7,874767.65 figure in the Operating Expenditures and Encumbrances table initially had me very concerned we were $1.7 million over budget. Second (the more important consideration will come next) I became less concerned when I it dawned on me the Expenditures and Encumbrances table includes Encumbrances. I doubt any monthly breakdown of the budget would include encumbrances in the YTD column. 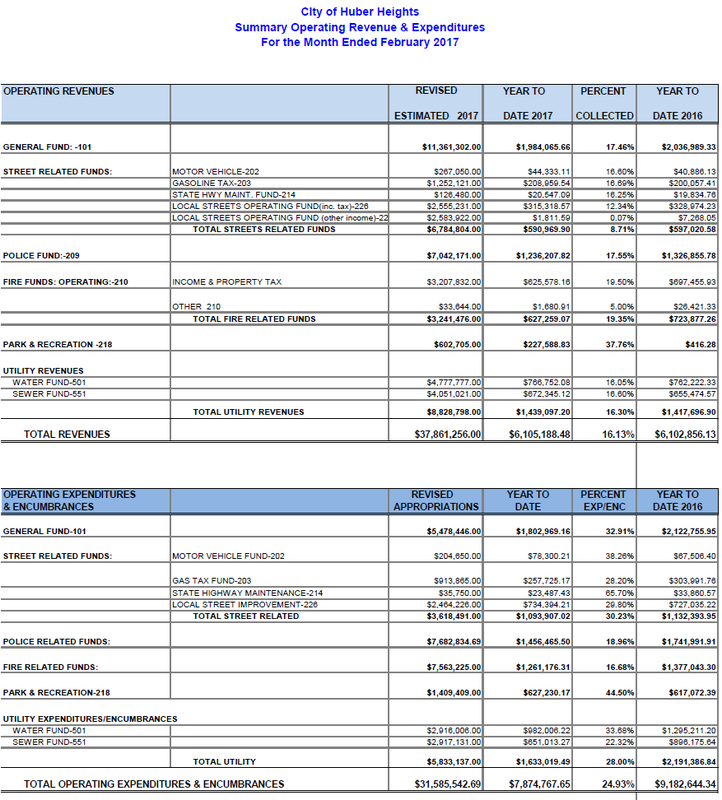 I stopped thinking of the last table on the page as being related to the budget when I noticed the YTD figures were the same as the Total Revenues figures in the Summary Operating revenue & Expenditures table. To have the actual YTD revenues match the estimated YTD expenditures exactly for two straight years would be an amazing feat. You might also look at those numbers Actual YTD 2017 Revenues $6,105,188.48 and compare it to the Expenditures and Encumbrances $7,874,767.65 and note it appears like we were short $1.7 million. Now there are two factors to consider, one being encumbrances. The other is that often during the year a government’s payroll bills come due before the taxes come in. That is why you never want to have a zero balance in the Reserve Funds. Otherwise, you have to borrow money and pay interest to make payroll. Evaluating the financial information available today it looks like we are $300,000 in the whole for tax collections and we can’t tell how we are doing on our expenditures. Council needs to make sure they know our financial status before they start the next discussion on if this is the right way to spend the money. Before I get into how to prioritize spending I want to share the first couple paragraphs of an email we received this week from the City Manager. I have good news that will be able to be address some concerns surrounding financial decisions within Parks and Recreation. We received a check Tuesday from Montgomery County for $72,880.78 to reimburse the CAUV (Current Agricultural Use Value) recoupment the City paid when the land for the Kroger Aquatic Center was purchased. Although we have been challenging this issue for a while, the funds were not planned on nor budgeted into the 2017 budget. I had finance verify where these funds had to be deposited, hoping we can put them into the General Fund. My concern was what funds were used for the land purchase. As it turns out, this amount will be paid back into the General Fund which can be transferred into the Parks and Recreation Fund. Our opportunity is to use these one-time funds for the Strategic Master Plan which allows for a budget-neutral approach to fund the entire study. The previously budgeted funds in the parks improvements line item would be unaffected! 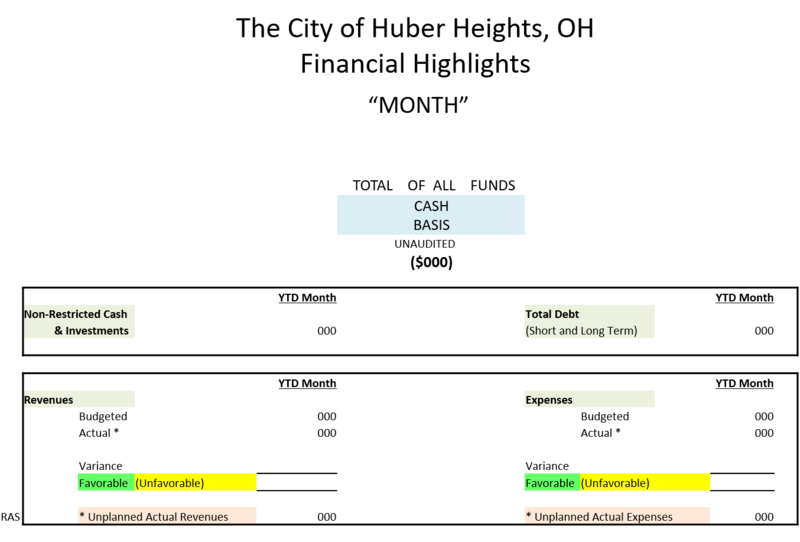 It is similar to a grant, where we would identify the one-time revenue for a one-time expense (which follows GFOA practices). In other words, we can move forward with the study (in its entirety if desired) without any financial impact to the current budget or use of currently budgeted funds. I’ve posted the rest of the Email here because it contains a lot of good information about the current Parks and Recreation Budget. 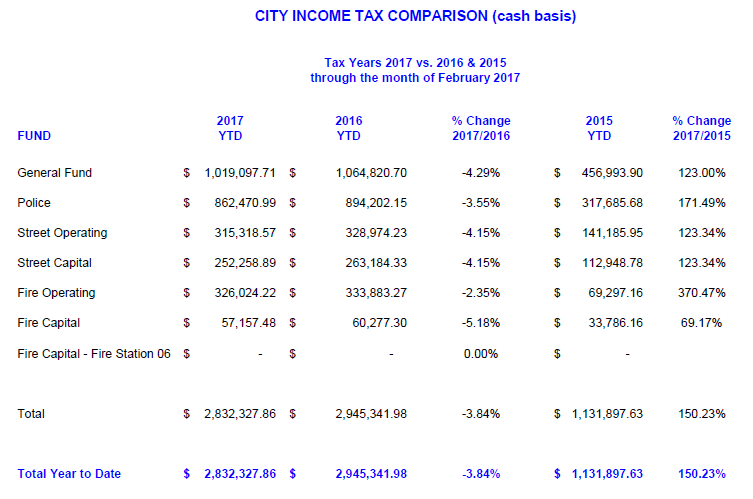 Hopefully, it will make it into the read ahead materials for Monday’s meeting so those interested in city government but not one of my blog readers get it. I posted the paragraphs above because the logic is flawed. You cannot have the discussion in those paragraphs until you have the discussion about the $300,000 difference between estimated revenues and actual revenues. You cannot have that discussion until you know the difference between real and estimated expenditures. You cannot have that discussion if you don't know how much money you have in the bank and how much you need for daily cash flows. As a general rule, the financial priorities of the city should be Police and Fire, Roads and Infrastructure, Parks and Recreation, Increasing the Cash Reserves. It is important to maintain the assets we have and then look toward improving services. The general rule is a good starting point, then broaden and adjust for specific circumstances. Another general rule is to make sure you know how much money you have before you spend it. In the discussion of the Parks and Recreation Master Plan I have tried to steer the direction of the conversation to the impact of this expenditure on the rest of the budget. A few meetings ago we had a discussion about a three-year grant opportunity that would pay 2/3rds of the cost of hiring new Fire Fighter personnel. The Chief Ashworth gave a well-prepared presentation that showed the costs and benefits of hiring between 0 and 18 Fire and EMS. My assessment of that report is the city should be working toward hiring 6 more FireEMS. If you recall that discuss the City Manager told us that even if the city were to get the grant even at a cost of less than $110,000 a year, he was not prepared to recommend even hiring three new personnel. 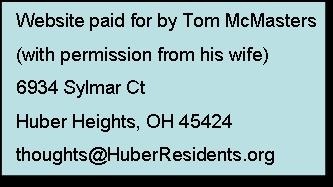 Although, Mr. Schommer’s email indicates that this additional money’s could be used to fund a Parks Plan without affecting the rest of the funded items on the Parks and Rec to do list, I rank the unfunded items on that list of higher priority than this master plan. Looking forward to the expected outcome of the Master Plan I anticipate a recommendation to do between $700,000 to $3.5 million worth of improvements. Unless there is money coming in from sources outside the community I do not see us fulfilling our needs for additional police, fire, roads and reserves enough to undertake this kind of expenditure for at least five years. 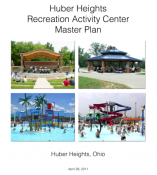 Completing this plan and having it sit on the shelf for 5 to 10 years instead of funding more of the unfunded park needs would be a disservice to our citizens. Ms Byrge indicates, without providing specifics, that she believes that if we start spending money on this project and unspecified entity will begin giving us the money we need to complete the project. In the last day I have heard a rumor is going around the community that we already have locked in a $2 million grant. My assessment on the wisdom of spending money on this project would change significantly with any verifiable commitment to providing outside money based upon the completion of this Master Plan. Until those specifics are provided council should give them no more credence than any other unverified rumor. It will be interesting to see council’s discussion. I think this is a good opportunity to see how your mayoral candidates think as well.